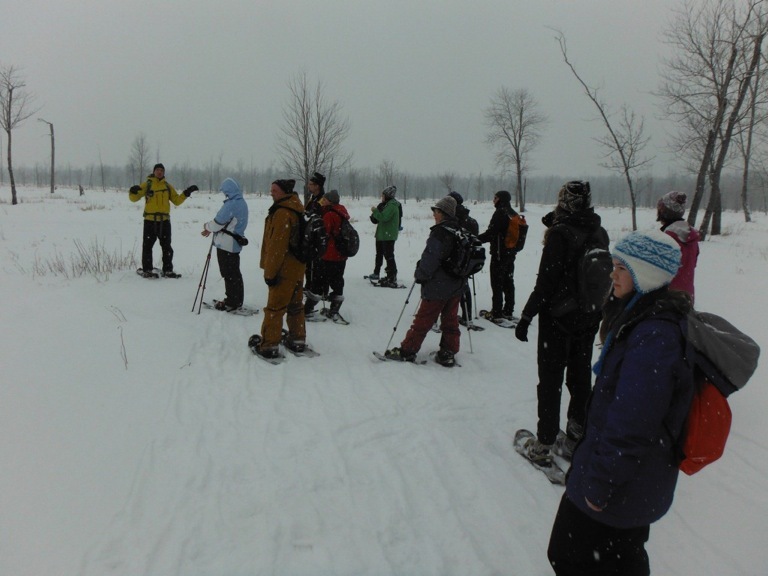 The Friends of the Minesing Wetlands celebrated World Wetlands Day by leading a snowshoe into the Minesing Wetlands. Our goal was to locate the current location of heronry (or rookery) and get a count on the current number of nests. We also wanted to share knowledge on past and current ecological conditions in the Minesing Wetlands. The FOMW crossed Willow Creek and then on to the Nottawasaga Levee. 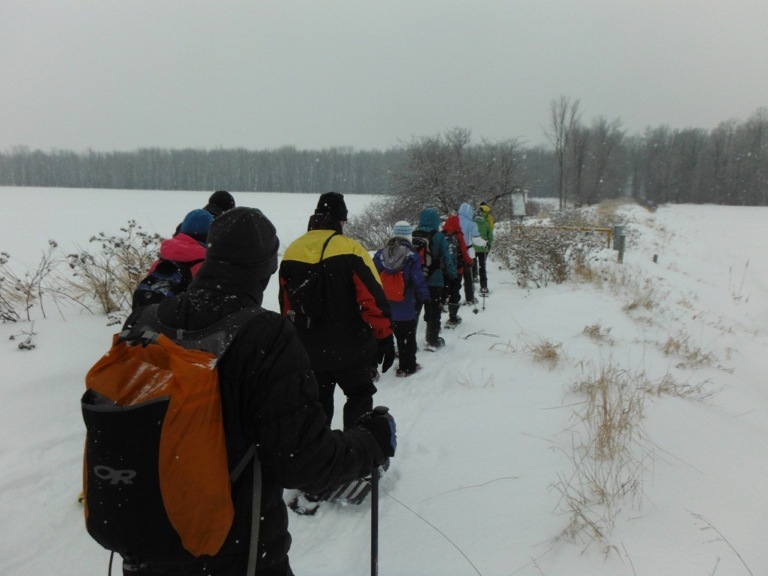 Although the overcast skies and heavy snow limited views, the group was still able to see the expansive floodplain. We came across examples of challenges facing the Minesing Wetlands including invasive species. From a recent analysis of forest cover in the Minesing Wetlands, Sean Rootham reported a 60% decline in deciduous floodplain forest between 1953 and 2013. This forest decline has led to a significant shift in wetland structure in the Minesing Wetlands where closed canopy swamp forest (floodplain and boreal) once constituted the majority of the wetland habitat, now, open canopy habitats (marsh, fen, thicket swamp) predominate. The group of friends collected fruit from Hackberry trees along the Nottawasaga River levee, which will support afforestation projects aimed to bolster remaining deciduous floodplain forest in the Minesing Wetlands. 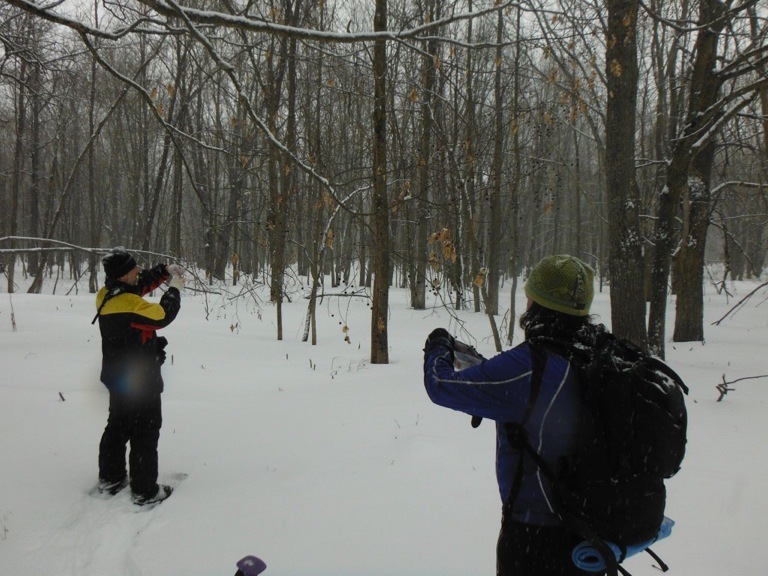 Also on the snowshoe the FOWM identified the nesting site of Great Blue Herons in the Minesing Wetlands. We confirmed 8 nests and 2 “maybes”. 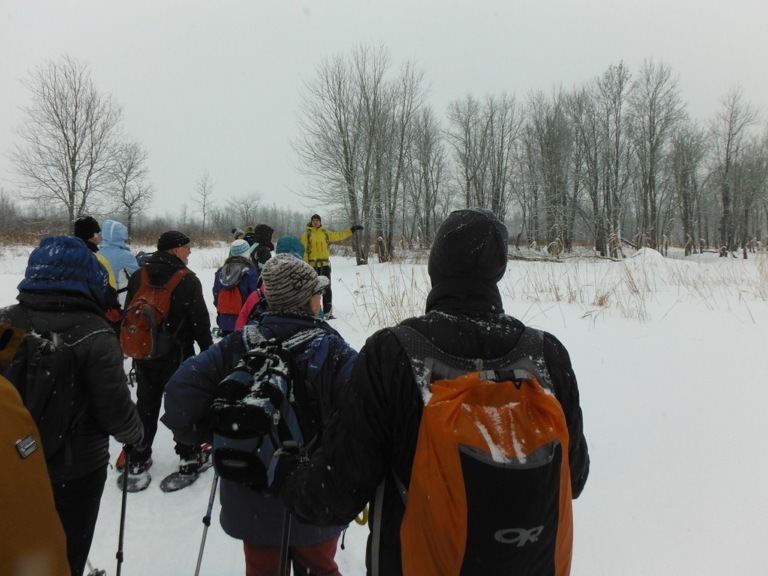 It was a fun winter activity on a perfect winter day for the Friends of Minesing Wetlands showing once again that the Minesing Wetlands truly is a “wetland for all seasons”. Categories: Photography, Special Project, Tour, Wetland Ecology | Tags: floodplain forest, forest change, FOWM, Heronry, Minesing Wetlands, photos, snowshoe, winter fun, World Wetland Day | Permalink.